The 2018 hurricane season in the northeastern Pacific begins like cannonball. After hurricane ALETTA, it is the turn of BUD to animate debates in this hurricane basin. The system is slightly stronger, but is expected to weaken as it approaches Mexican peninsula Baja California. It is in the day of June 9, 2018, that the cyclogenesis of the future hurricane BUD has ended. After having reached the stage of Tropical Depression and having been numbered 3E, the system continued its intensification to be baptized during the same day. At the last point made by the Cyclone Regional Specialized Meteorological Center of Miami at 03:00 UT, BUD was located around 17.6N and 107.6O and track northwest at about 11 km/h. BUD is a major category 3 hurricane on the Simpson Saffir Scale. Central pressure is about 951 mb and the maximum sustained winds over 1 minute are estimated at a little over 200 km/h (110 kt) and associated with gusts of 250 km/h (135 kt). 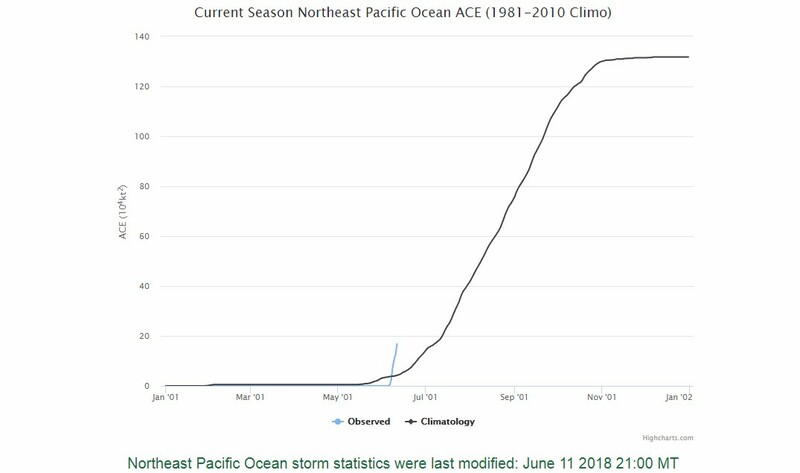 With 2 major hurricanes in the same month, Accumulated Cyclone Energy (ACE), which defines the activity level of a season, is already above climatology average. cyclonic (picture above). 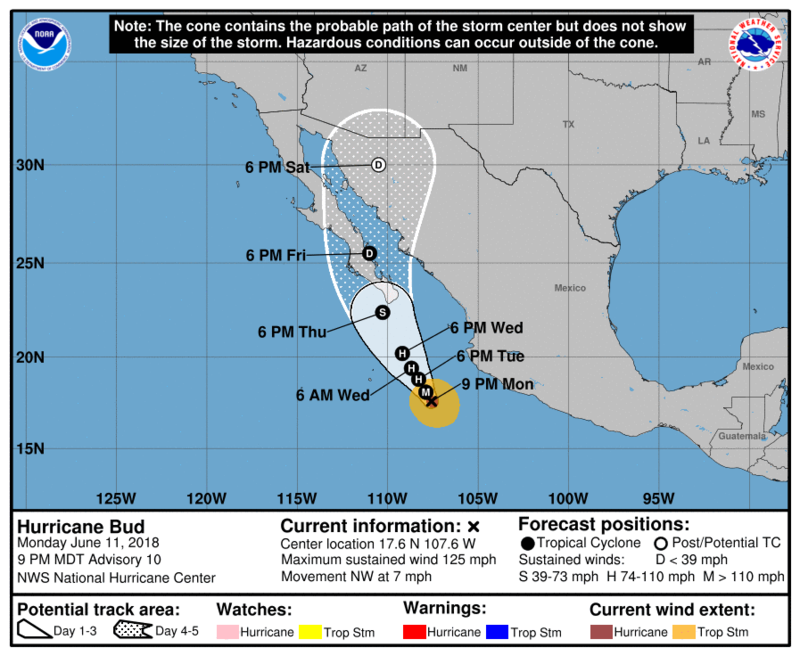 The southern Mexican peninsula of Baja California is therefore under threat from Hurricane BUD. According to the RSMC forecasts, the system should soon weaken due to insufficient ocean heat content at this time of the year, which is rather good news for the peninsula. BUD could lose its hurricane stage before landfall on Thursday. Even if a weakening is the scenario retained, the phenomenon is expected to bring heavy rain to the southern of Mexico. The RSMC warns that these rains could cause rapid floods and potentially deadly mudslides. The global cyclonic news is currently marked by Hurricane BUD, which is evolving over pacific North-East. CIMSS (Cooperative Institute for Meteorological Satellite Studies) published on its blog an amazing satellite IR loop of the cyclone at the moment when it peaked at Category 4 intensity.